HITHER CAME CONAN THE CIMMERIAN, BLACK-HAIRED, SULLEN-EYED, SWORD IN HAND, A THIEF, A REAVER, A SLAYER, WITH GIGANTIC MELANCHOLIES AND GIGANTIC MIRTH, TO TREAD THE JEWELED THRONES OF THE EARTH UNDER HIS SANDALLED FEET. Jeweled Thrones of the Earth presents six complete and ready-to-play adventures for Robert E Howard's Conan: Adventures in an Age Undreamed Of. Within these pages gamemasters will find the means to take heroes across the whole of Conan's world. Explore a lost city in the steaming jungles of the south and dare to face the Feathered Ape, as well as other menaces in Devils Among Green Stars. Sail across the eons to an island enthralled by a demon-goddess, and attempt to escape the hand of fate in The Pact of Xiabalba. Seek unimaginable wealth within The Caves of the Dero, whose denizens harbour a terrifying secret. Defend the frontier against an attack by Picts, spurred to war by an ancient evil known only as The Ghost of Thunder River. Discover the secrets of a sinister thief-cult hidden within the heart of a city watched over by The Thousand Eyes of Augmag-Bel. Fight slavers in a desperate battle to win freedom and escape the horrors of The Red Pit. Uncover a diabolical and degenerate race lost to the desert and time, in The Seethers in the Sand. Guidelines for linking these adventures together into complete campaigns. Scattered Jewels... a dozen exciting adventure seeds to help spur further exploits. 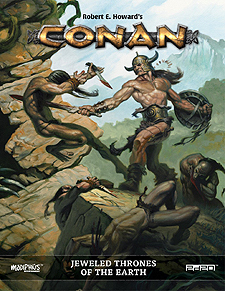 Written using Modiphius' 2d20 system, these ready-to-use adventures include new monsters and foes suitable for any CONAN game: ranging from horrific crawlers, giant-king skeleton warriors, the Worm Within, cave horrors, the monstrous Watcher, the mighty a'ghama, and the degenerate saurian descendant of the ancient serpent-folk. This book requires the Robert E Howard's Conan: Adventures in an Age Undreamed Of core book to use.